Hello from the Village of Seneca! Welcome to Seneca, where you can "Find Your Connection". Whether you are here to work, live or visit, the Village offers something for everyone! The historic Illinois & Michigan Canal is located through the center of our downtown area. The canal provides a great opportunity for photographers, hikers, joggers, nature lovers, bicyclists, snowmobilers and cross country skiers. Adjacent to the canal is the Hogan Elevator which is the oldest remaining grain elevator and tours are provided through the Seneca Historical Guild, contact Village Hall for details. The Village of Seneca also has a wonderful well-maintained community area named Crotty Park. The park has two shelters, a baseball field, open grassy area and accommodates the disabled with handicapped parking and a paved sidewalk. One area of interest is the Illinois LST (landing ship tank) memorial located at the flagpole in Crotty Park. The granite memorial honors those who built and utilized the LST's during WWII, Korea and Vietnam. Seneca was chosen by the Chicago Bridge & Iron Company as an operational shipyard from 1942-45. Our Village has another landmark that I encourage you to visit...located on Route 170 across from the Seneca Library is the Veterans Memorial Wall monument. The memorial honors all who have served their country during the various wars. There is more than one opportunity to become acquainted with the Village of Seneca, in addition to our website, we offer Facebook or Twitter. Simply join us by clicking on the icons above, and become a fan...it is that simple! Thank you for visiting our website and we hope you visit our community soon! 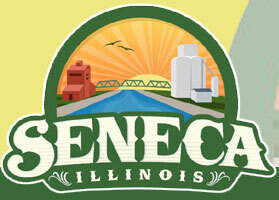 There are many people who make Seneca an enjoyable place to live and raise children. The Village Council would like to extend a sincere thank you to our own Police, Ambulance, EMA and Fire services. Also, thank you to all who volunteer their time to the various Seneca sport organizations, Festival Committee, Cruise Night Committee as well as the members who make up the several Boards for our community. The Village Council meetings are held the first and third Tuesday of each month, 7P.M. at Village Hall, Everyone welcome to attend! Comprehensive planning is part of an ongoing growth management process that is needed to ensure effective implementation of a community's future vision and review of new development. The Village of Seneca Code is now available online. The Village of Seneca is approximately one hour from the Magnificent Mile, Navy Pier, downtown Chicago or both Chicago O'Hare and Midway airports. Interstate 80 is a few minutes from Seneca and Interstate 39 provides easy access to Bloomington, Rockford and Peoria. These three cities are all just over one hour drive time and offer major airports and large healthcare facilities.